The VT-2 is housed in a NEMA 4X Enclosure, designed to meet all Commercial and Industrial applications. The VT-2 can be configured for multifunctional tasks used for revenue billing, energy management, or check metering. 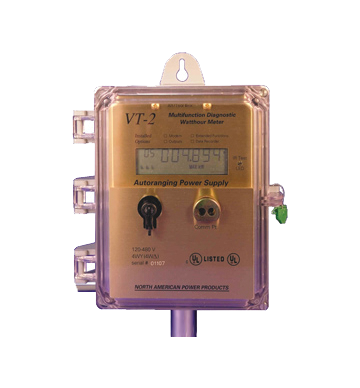 The VT-2 is a solid state multifunction watt-hour meter capable of displaying kWh, Demand, Time of Use, and kVA or kVAR readings. Data is displayed on a liquid crystal display (LCD) along with potential indicators and consumption annunicators. Extensive Installation Diagnostics that will detect an inverted Current Transformer or Cross Phasing of the wiring. Nema 4X Enclosure. Certified 0.2% accuracy at all voltages. No Multipliers are EVER required.